Yeudy Garcia does not have any MLB stats for the season. Yeudy Bamba Garcia (first name rhymes with "Judy")...Is a 2010 graduate of high school...Also attended college in the Dominican Republic before signing with the Pirates in 2013...Lists Albert Pujols as his favorite athlete while growing up...Also enjoyed playing volleyball as a youth...Signed by Pirates scouts Rene Gayo and Juan Mercado. Posted a 5-7 record, five saves and 5.04 ERA (75.0ip/42er) in 31 total appearances (11 starts) between Double-A Altoona and the GCL Pirates (rehab)...Began season in Altoona's starting rotation...Went 2-5 with a 6.50 ERA (44.1ip/32er) in 11 starts and 2-2 with a 3.25 ERA (27.2ip/10er) in 18 relief appearances with the Curve...Recorded nine strikeouts in 3.2 innings on 4/23 at Akron but allowed five runs in the fourth inning while suffering the loss...Allowed two unearned runs in 5.0 innings while earning first Double-A win on 5/7 at Akron...Was placed on the seven-day disabled list on 6/20 with a right oblique strain...Made two rehab appearances with the GCL Pirates before returning to Altoona on 7/4...Earned first Double-A save on 7/8 at Akron...Picked up first relief win on 7/19 vs. Harrisburg... Recorded a 2.0-inning save in clinching game on 8/29 at Richmond...Posted a 2.96 ERA (24.1ip/8er) and added three saves over 15 outings after moving to the bullpen full-time in early July...Pitched a scoreless inning on 9/8 at Bowie in Game Two of the Eastern League Division Series...Earned a save in Game Two of the Eastern League Championship Series with a scoreless ninth inning on 9/13 at Trenton...Was rated as Pittsburgh's 19th-best prospect by MLB.com following the season...Went 3-for-5 with a pair of doubles at the plate with Altoona. April 1, 2019 RHP Yeudy Garcia assigned to Altoona Curve from Bristol Pirates. 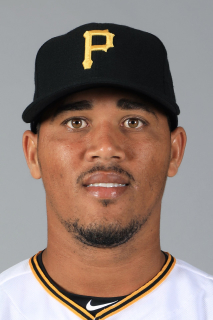 February 26, 2019 RHP Yeudy Garcia assigned to Pittsburgh Pirates. September 2, 2018 RHP Yeudy Garcia assigned to Bristol Pirates from Altoona Curve. August 25, 2018 RHP Yeudy Garcia roster status changed by Altoona Curve. January 22, 2018 Pittsburgh Pirates invited non-roster RHP Yeudy Garcia to spring training. July 8, 2017 Altoona Curve activated RHP Yeudy Garcia from the 7-day disabled list. June 29, 2017 Altoona Curve sent RHP Yeudy Garcia on a rehab assignment to GCL Pirates. June 20, 2017 Altoona Curve placed RHP Yeudy Garcia on the 7-day disabled list. Right oblique strain. August 21, 2016 Bradenton Marauders activated RHP Yeudy Garcia from the 7-day disabled list. August 14, 2016 Bradenton Marauders placed RHP Yeudy Garcia on the 7-day disabled list. Sprained right toe. April 5, 2016 RHP Yeudy Garcia assigned to Bradenton Marauders from West Virginia Power. April 9, 2015 RHP Yeudy Garcia assigned to West Virginia Power from DSL Pirates. March 5, 2014 RHP Yeudy Garcia assigned to DSL Pirates. October 12, 2013 Pittsburgh Pirates signed free agent RHP Yeudy Garcia to a minor league contract.